Come join us for the first book launch workshop in the Bay Area! 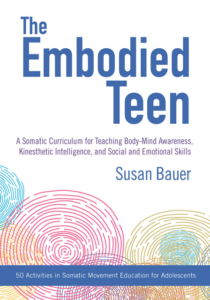 This workshop is based on Susan’s new book, The Embodied Teen: A Somatic Curriculum for Teaching Body-Mind Awareness, Kinesthetic Intelligence, and Social and Emotional Skills, which is a groundbreaking curriculum for teaching teens how to integrate body and mind, enhance kinesthetic intelligence, and develop the inner resilience they need to thrive, now and into adulthood. Lessons are based in somatic movement education, and are adapted specifically for teens and young adults based on decades of teaching in the US and abroad. But what is somatic movement education? And how do you adapt it to teens so they actually want to participate? In this workshop, you will get a chance to experience this somatic movement education approach for yourself, and get some answers to these questions as well. This event is suitable for all educators, parents, and anyone interested in supporting teens to be more vibrant and empowered individuals. Bring a curiosity about movement, anatomy, and self-awareness, along with comfortable clothes to move in. After the workshop there will be a time for questions and an author book signing. Buy your book, or bring your copy to be signed. Registration: To register you can purchase tickets on Eventbrite; or with questions email susan@susanbauer.com or call 510 333-6415 for more information. Some tickets may be available at the door if space is available.